a disability can be challenging, which is why the American Foundation for the Blind (AFB) teamed up with the Toy Industry Foundation, Inc. and the Alliance for Technology Access to produce Let's Play: A Guide to Toys for Children with Special Needs. The Guide helps parents select toys that will have the most positive experience for children who are disabled - whether they are dreaming of Swing 'N Score Baseball or hoping to find the My Little Pony Celebration Salon beneath the wrapping paper. Let's Play features toys reviewed by more than 100 children with a variety of special needs, including children with visual and hearing impairments. The Guide offers descriptions of why certain toys are more appropriate and fun in addition to labels indicating who may find specific toys most enjoyable. All of the toys in Let's Play can be found in stores throughout the country. Toys like the Lullaby Gloworm, which is soft and plush and sings seven lullabies with one squeeze or the Laugh & Learn Learning Phone, which allows children to hear their ABCs and 123s while promoting tactile exploration, are just two of the many toys recommended by the guide for children who are blind. 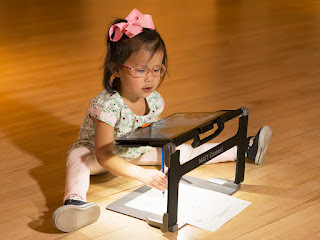 For children with low vision, the guide also suggests toys like the Lite-Brite Illuminart Easel, which brings pictures to life with a lit screen and stimulates available vision. For a fully accessible guide for visually impaired readers please visit http://www.afb.org/toyguide.asp. Free print copies can also be obtained through the AFB bookstore at http://www.afb.org/store/product.asp?sku=toyguide&mscssid=. "Toy Guide for Differently-Abled Kids"
Toys R us has published a free guide that features toys designed for children with special needs. It will be available at Toys R Us stores and online at http://www.toysrus.com/differentlyabled. The 85 toys in the guide are sold nationally, with just six available only at Toys R Us stores. Each toy in the 52-page guide includes a detailed description of how it can be used, along with icons indicating whether the toy can stimulate development in such areas as creativity, self esteem, vision or hearing. The criteria include toys that are easy to handle or manipulate, and don't have a "right way" of being used. Toys R Us started the guide in 1994 and will print 600,000 copies of the "Toy Guide for Differently-Abled Kids" in 2006, about 100,000 more than previous years. Click this link to view the Toy Guide for Differently-Abled Kids from Toys R Us: http://www.toysrus.com/differentlyabled.